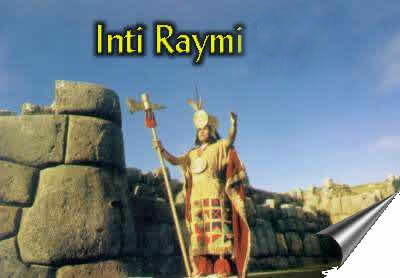 Add your URL to " Inti Raymi part 1 : history "
Every year on the 24th of June Cusco celebrates the festival of Inti Raymi. This festival was celebrated by the Incas as the Festival of the Sun where the God of the Sun Wirracocha is honored. The Inti Raymi symbolizes the eternal consecration of marriage between the Sun and his sons, the human beings. Inti Raymi was the most important festival of the Inca empire Tawantinsuyu which based its religion on the cult of the Sun. On the 24th of June they celebrate the winter solstice, in other words the beginning of the Sun's New Year. Scientifically the solstice begins on the 21st of June, but according to the Pacha Unachaq, a sundial used by the Incas, the sun stays some days in the same place before rising on the 24th of June. This day was proclaimed by the high priest as the New Year: Inti Raymi! The inhabitants of Cusco traditionally involve about everybody, including tourists, to enjoy and marvel this most special day. Countless additional events are to be seen before, during and after the 24th. These are expositions, street and square activities in daytime and in the evening live concerts given by the very best of Peru's diverse musical talents, staged in the Plaza the Armas. This is the second biggest festival in Latin America, after the carnival of Rio. Most of the concerts and expositions are for free and sponsored by the city of Cusco and Peruvian companies. For more than half a century the festival takes place at the archeological complex of Sacsayhuam�n, also called the Sacred House of the Sun. More than 200 thousand people come together to witness the most beautiful spectacle of the year where more than 500 actors proudly bring the past alive. The highlight of the Inti Raymi is in the oration given by the Sapa Inca and the high priest in the original language of the Incas, Quechua. This ancient language is still spoken in wide areas in and around Cusco, mainly in the Peruvian highlands. 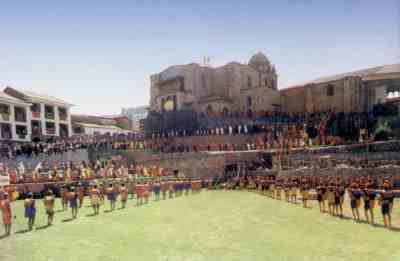 For a decade the Inti Raymi starts in the square in front of the Qorikancha,also known as the Santa Domingo in the Avenida del Sol (see picture). The Sapa Inca honors, with an eloquently strong voice, the blessings of the Sun and this most sacred day. After this initiation the procession moves with imperial dignity to the fortress of Sacsayhuam�n. At the top the Inca is carried on a golden throne (see picture next page). The abundant gold and silver worn by the men and women, respectively, represent their status as the high society and invokes deep respect for their fallen empire. What is the artwork they do for inti raymi? What a shame, I just missed out on seeing this marvelous festival. My friend from Lima is a tour guide and he was there for the week.